Technically this belongs in the "I Read It" catagory because Jennifer recommended it, so I'm linking this review up to the I Read It carnival over at 5 Minutes for Books. 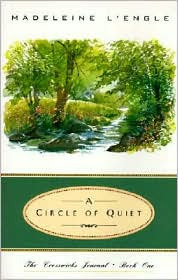 Quite honestly, I'm not sure what I thought about A Circle of Quiet . I took it with me when I went down to Texas to be with my dad. I thought the title was promising for what I knew would be a stressful situation. The title definitely describes the book well. It IS a quiet read. I had no expectations or knowledge of the book going in so I was kind of caught of guard when I discovered it was L'Engle's journals from the years she and her family lived in their Crosswicks home. The back of the book describes this book as falling into the "Spirituality/Autobiography" categories and I would say that is accurate. In short, L'engle spends this book talking about her spirituality. She's frequently blunt and to the point. Sometimes I found her to be crass in her description of things. I wondered how she got away with relaying certain information about her neighbors. I can't imagine that their feelings were not hurt, should they have ever been aware of the situations she was revealing in her journals -- written specifically for the world to see. She did not keep this journal as a private record of her life. She wrote it as letters to the public to satisfy some curiosity about her. I do not agree with her theology (hardly at all) and I frequently found her brash and insensitive. Certainly, this book did not make me like her anymore than I already did (after my failed attempt at understanding Wrinkle in Time). I suspect that there's just something I'm not getting. People tell me so. I feel wrong for not liking her very much. But am I really? Because I really just do not enjoy what comes out of her pen very much. All that said - I find her writing style (at least in these journals) to be intriguing and curious. She does say a lot of thought-provoking things that give the reader pause. She explains "just enough" of what she believes without belaboring any one of her points. This book feels like a conversation with a story teller. I certainly was not bored while I was reading and I wasn't put off enough by our differences to stop reading. She dances a fine line with me and I'm not sure which side I'm going to get off on. I'm not opposed to reading more of her writings and I'm not enthusiastic either. My curiosity levels are piqued. I still don't understand why people are in love with her writing. (I'm sure some of you will continue to try to enlighten me and you can feel free to do so. I'm just sayin' I'm not convinced!) Again, the woman is downright crude at times. Yet there's something cozy about taking your dog with you to the small town library to write. There's something intriguing about a person who feels such a strong urge to write, that she cannot relax unless she's gotten her thoughts out. Her stories, she says, tell themselves. Certainly if you want to know Madeleine L'Engle better, you will want to read A Circle of Quiet and the rest of the Crosswicks journals. 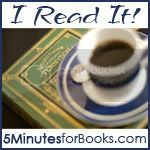 It reads at a steady and calming pace - which is something I appreciated very much when I was reading it. It was a good read for me at the time. I'm just not sure if that time will come again so I can't promise I'll read anymore for myself. Having read A Wrinkle in Time in sixth grade (and getting it but not GETTING it) and then reading The Love Letters earlier this year (http://hopeistheword.wordpress.com/2009/02/20/the-love-letters-by-madeleine-lengle/), I understand what you mean. I do think L'Engle is worth the effort, though, if only to grow me as a reader. I'm one of those people who, as a Christian and as a writer, finds a great deal in common with L'Engle. (For one thing, we're both Episcopalian.) Reading your post pushed me to think about WHY I feel this affinity for her (so thanks for writing this! ), and I think I can boil it down to her honesty and integrity; she didn't pretend that her faith or her career were easy, but faced her doubts squarely and kept on trying to live with them. I've read a lot of other writers who (IMO) say what they think others want them to say or what they think they SHOULD say, and at this stage of my life, that just doesn't work for me. So I think that's what drives me to keep reading L'Engle -- even if/when I disagree. I respect your reaction, though. If you decide to give her another try, I've reviewed a few of her books (including this one) at my blog. I also consider her WALKING ON WATER: REFLECTIONS ON FAITH AND ART one of the most thought-provoking guides for writers (and other artists) who happen to be Christian. I read it and I didn't always get it, though her prose is beautiful which is, I guess, its own sort of enjoyment. Hmm-- I can't say that I disagree. I like her Crosswicks Journals, but they are very quiet (and actually the 2nd and 3rd have even less focus, I thought), but I've heard that the one on marriage is good. I think that Mindy (below) has a good take on why so many identify with her thoughts on spirituality. She is VERY open about it all -- doubts and all. Like Steph--I was going to say that you would like the Austin Family Chronicles better. They are very old-fashioned and traditional children/YA books. We are listening to a Wrinkle in Time on our LONG trip. I haven't revisited it since childhood (but I loved it then).